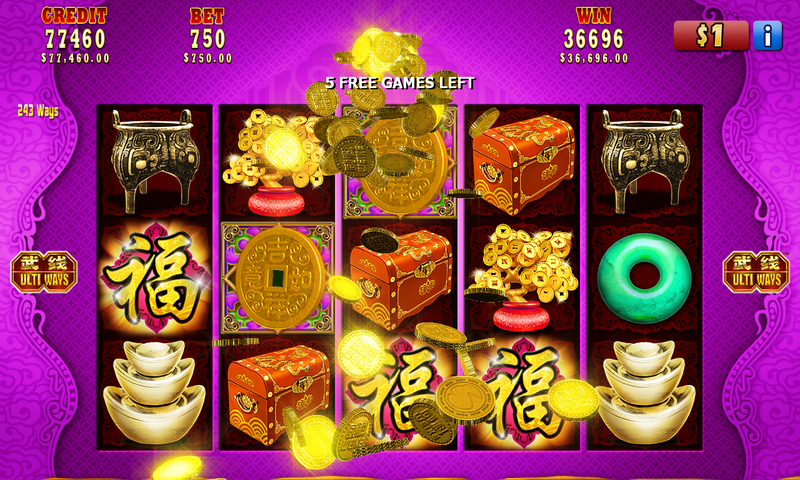 HOME > PRODUCTS > SLOTS > GAMES > FU WA! Activate power and potential as you build your wealth! The lucky frog is auspicious icon of good fortune with a strong tendency to bring in money and opportunity. Be presented with riches and wealth as you open the gates to Victory! [Gold Coin] substitutes for all symbols except [Fortune Frog] and appears on reels 2, 3, and 4 only. 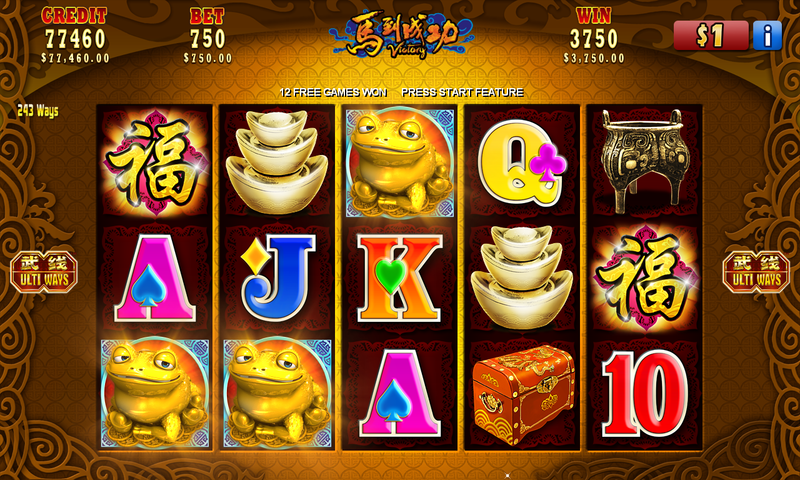 3, 4 or 5 [Fortune Frog] left to right trigger 12, 15 or 20 free games respectively. 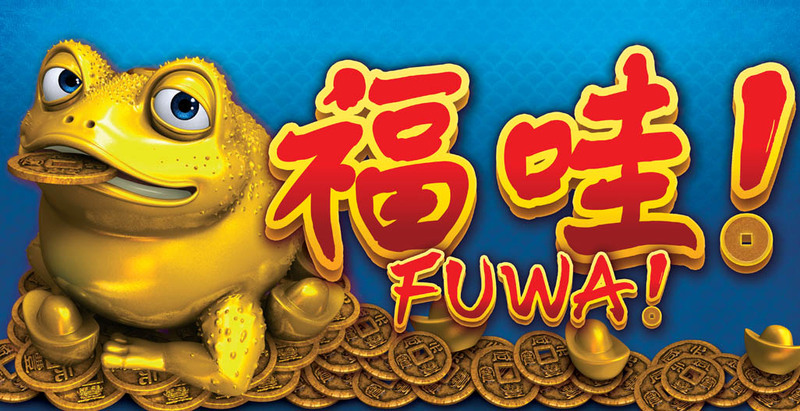 During free games, only [Gold Coin], [Fortune Frog], [Fortune], [Coin Plant], [Chest], [Coin Pot], [Ingot] and [Jade] will appear. The Victory Feature may be triggered at random during any winning game. If [Victory Logo] changes to [Golden Victory Logo] and continues to animate, then 12 [Golden Token] will appear. 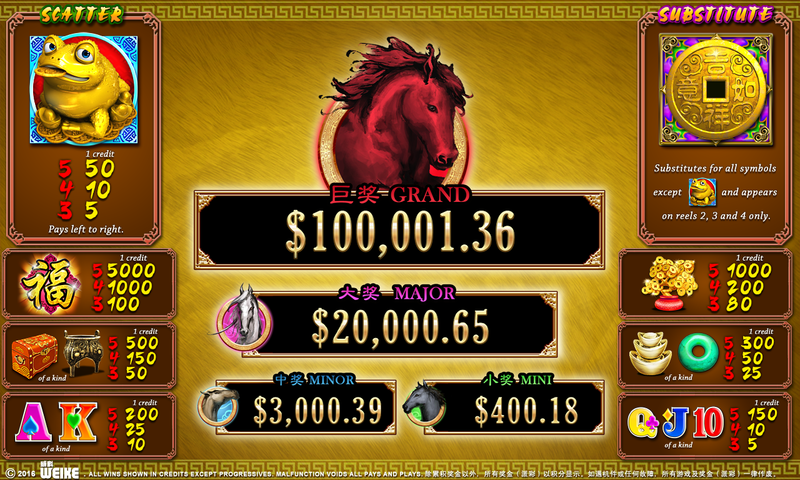 Touching a [Golden Token] will reveal the symbol of a jackpot level: [Grand-Red Hare], [Major-Dilu], [Minor-Lightning] or [Mini-Shadowless]. During the Victory Feature if [Go Lucky] is touched a number of remaining [Golden Token] will automatically be selected at random until 3 matching symbols are revealed.